In this bathroom, the windows felt bare. Our roman shades made the ceilings of this bay window look taller. They're a nice backdrop to the unique silver chandelier. 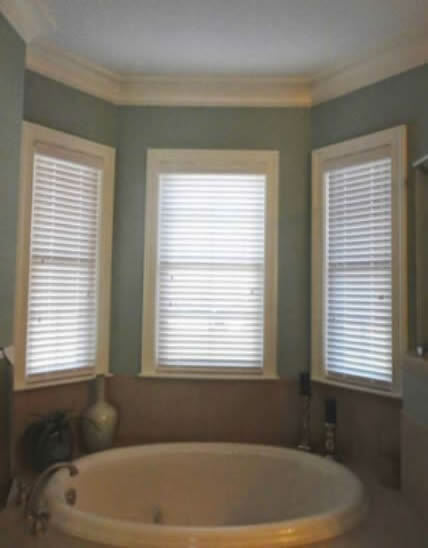 We offer the best solutions for window treatments, for looks, function, and timeless styles. Notice how the gray fabric repeats the color in the beautiful teal and gray tiles we used in the shower. We painted the walls in a soft shade we call "spa". Our soft shag rug, candlesticks, and slipper chair were the perfect final touch.